You’ve no doubt heard of Aesop’s Fables, well, here’s one from me… A tale of two recruitment strategies. Harriet works in recruitment at Traditional Bank. A new role is released for a vacancy in Debbie’s team. Debbie, like most of the hiring managers in the bank is keen to recruit more women. As usual, the role is published on LinkedIn and the bank’s careers’ website. Harriet is not surprised to find she has an all male shortlist; she ferrets around in her database for past female applicants and selects some for interview, telling them not to worry about their lack of appropriate experience for the role, “It’ll be OK.” She has submitted the list on time and on budget – no external recruitment companies have been used, and she has met her diversity targets. Debbie, the hiring manager, receives the candidate shortlist and is initially pleased to see some female candidates; this is soon followed by dismay as she sees that the women seem to be lacking the relevant experience. Despite being keen to create a diverse team, the result is a male hire as he has the relevant experience and is the right person for the job. At financial services company, Progressive Asset Management, Anna works in recruitment and has just had a role released to her for Liz’s team. 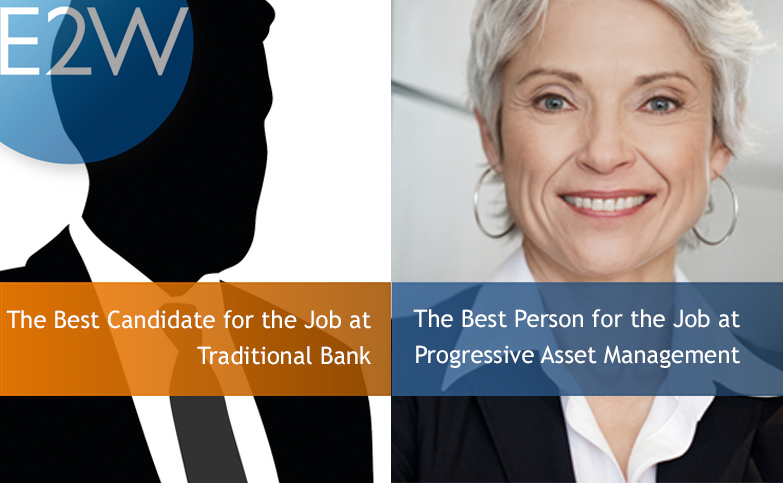 Progressive are taking positive action in the recruitment process. In addition to putting the role on LinkedIn and Progressive careers’ website, Anna is also able to engage with a specialist diversity recruitment agency that Progressive have formed a partnership with. The agency has a large network of women working in the sector and has a proven track record of providing female candidates for a large range of open roles. In fact, a high percentage of new hires have come from this agency’s candidates in the past twelve months. Anna creates a shortlist of ten candidates for Liz’s role – five men and five women, all with relevant experience and at the right stage of their careers for this position. Liz is thrilled with the balanced list and sees the majority at interview, hiring the best person for the job, who, on this occasion, happens to be a woman. Anna and the recruitment team have achieved their goal in a timely fashion and know that the new hire will benefit Liz’s team and the organisation as a whole. Progressive are meeting their commitments to becoming a more diverse and inclusive firm and are gaining a competitive advantage as a result. Meanwhile, back at Traditional, Debbie is pleased with her hire but disappointed that her team continues to be gender imbalanced. She hopes that she’ll have more luck with future hires and commits to speaking to the Diversity and Inclusion team and senior management about their approach to diversity recruitment. In the past, her ideas have fallen on deaf ears though. Debbie is considering her future at Tradition: she can see how other banks are embracing diversity and inclusion, and are becoming places where she could flourish and succeed whilst also being her genuine self. To deliver change you need to take positive action and invest. You will receive a return on your investment. You will not deliver change by only setting arbitrary targets. You will only increase cost because, if you fish in the same old pond using the same old methodology, you will, at best, only increase the number of the same type of fish you catch. As we have shown, recruitment teams in financial services need to take positive action to support their firms commitment to better gender diversity. E2W manage a community that is now approaching 10,000. Ten thousand women working in senior positions in investment banking and asset management – some are actively looking for new roles, others are more passive in their search. But they all trust and support E2W to ensure that the opportunities we introduce them to will be with firms that will support them in their careers and enable them to achieve their potential. E2W only work with Investment Banks and Asset Managers who invest in and take positive action in the recruitment process to ensure they get the benefits of better diversity. These same firms also foster environments where our candidates will flourish, succeed and can bring themselves to work. For more information about E2W please contact us.